“Hello, my name is Sally. I forgot when we last spoke or what you wanted from me, but please call me when you are ready to buy.” This is not a lead nurturing process that is going to grow your business. Are you a sales spreadsheet closet junkie? Do you have a spreadsheet and customer relationship nurturing problem, but keep ignoring it? Maybe you keep hoping that the problem will go away on its own, and that you’ll get enough new business that the spreadsheet will disappear and magically be replaced by an actual system that provides true value. If this sounds familiar, that’s okay. After all, just as many small business owners start off with boxes of receipts before handing their tax management and preparation over to their first CPA, many also have spreadsheets in the closet that they use for tracking customer leads and relationships. 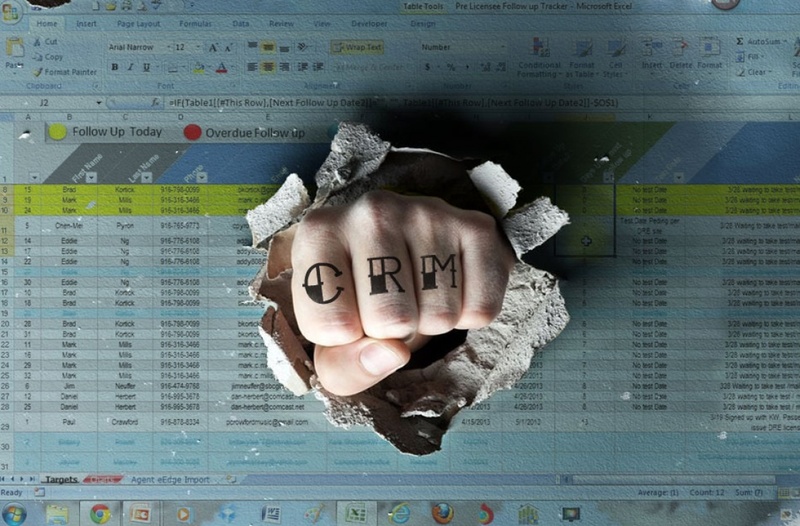 So it might be time to think about a Customer Relationship Management (CRM) solution. First, let’s make sure we are on the same page regarding lead nurturing and its importance to business success. Lead nurturing is the process of continuously developing relationships with customers at every step of their buying journey. It requires understanding and listening to the needs of prospects and customers to provide them the information they need to further develop the relationship. It may include customer touches in the form of face-to-face conversation, social media interactions, emails, phone calls, or even a text message. Lead nurturing is foundational to the success of marketing and sales. In today’s competitive world, customers have almost immediate access to unlimited resources to research their options, gather intelligence, and make the best buying decisions possible. Bottom line: they do their research. Unfortunately, in many cases, the businesses selling to these social- and research-savvy customers have not taken the same amount of time to understand them. These businesses may not know the first thing about their potential customers even as they move through the buying cycle. This can be caused by a lack of knowledge in how to research or how to compile, track, and learn from the data once they do have it. Or it could be they don’t have the software in place to properly track the data and buyer touch points in a way that adds value to the relationship and process. Even if you are strapped for time, cash, and resources to organize your customer data, chances are good you’ll benefit from investing in a CRM application. CRM can provide a myriad of business benefits, including reducing costs and increasing margins, boosting customer satisfaction and retention, adding to revenue, and even identifying operational trouble spots to correct. CRM software can help you organize your data, continuously nurture leads, improve deal flow, increase sales, and most importantly, keep you “front of mind” with your potential buyer. And the days of CRM solutions being available and affordable only to large businesses are over and done. There are many agile and affordable options today, even for the smallest of businesses. They offer monthly subscriptions with cloud-based solutions that make selection, implementation, and management quite easy. Could it be time that you move from the spreadsheet to a CRM solution? If you say yes to any of these questions, then you’ll know the answer. You don’t actively prospect for business leads; you are reactive and take them as they come in. You have no idea what stage of the buying process your prospective customers are in, and no easy way to track leads. Critical touch points are delayed or falling through the cracks. It seems that your prospect gets too many contacts from too many people, or that the contact is too late or not at all. When an employee leaves your company or changes positions, it’s as if the new person is starting from scratch in building a relationship with existing customers. You know that the best source of increased revenue is from existing customers, yet you lack a system that allows you to track what customers are currently buying from you, and what opportunities exist to cross- or upsell. You lack any useful reporting. You wish you could see one simple report highlighting sales opportunities and needed actions to ensure that your prospects are being nurtured. Your sales team is blaming marketing for lack of new sales and delay in deal closings, and marketing is blaming the sales team. Unfortunately, you lack the data to prove where the root problem lies. Competitors are beating you more regularly and winning business you’d like to have. You don’t know why you are losing or where in the sales cycle you lost the deal. You spend far too much time in the spreadsheet black hole trying to figure out macros and formulas that are far above your knowledge level. It takes too long to find answers for internal teams that used to rely on you. They have since given up and no longer ask you for the information. Do you need a lead-nurturing and spreadsheet intervention? Don’t let the lack of understanding and connecting with your customers get the best of your sales and business success. If it’s time for a CRM solution—and it probably is—embrace the change. CRM will save you time and headaches, and enable you to pull that spreadsheet out of the closet and fill it instead with party supplies to celebrate a successful year of sales and growth! This article was first published on SAP Digital. Pam Moore is the CEO & Co-Founder of Marketing Nutz, an agile, social media and digital marketing training and consulting company that specializes in personal branding, conversion optimization and helping business leaders not just do social or be social, but be socially relevant. She also hosts the popular Social Zoom Factor podcast and is the co-founder of the Social Media Profit Factor training academy providing entrepreneurs to Fortune 100 brands information, tools and resources to build and monetize their online platforms. Pam is ranked by Forbes as a Top 5 Social Media Power Influencer, is an avid international keynote speaker and best-selling author. She has 20 years experience helping entrepreneurs to Fortune 10 organizations build winning brands and integrated platforms that sustain business and life.